In other areas of this website you will find information about the breed (Large Black) and production system (genuine free-range) used to produce your Christmas pork. Why not think about supporting us during the year as well as at Christmas? As the purchaser you can try the product and also be assured that the pigs are cared for as you would expect. We also get to know you and you will be more likely to be in line for our highly sought after products when the festive season approaches. We prefer not to be rushed when bringing you the finest product possible and therefore we ask that you think well in advance about your Christmas order. It takes time to pickle, smoke and cook your ham and we are not a Supermarket where you can get exactly what you want from the shelf at a moments notice. Christine takes time and loving care to grow the pigs (approximately one year) and our butcher takes time and loving care in the processing of them. We therefore ask that you respect our work and give us plenty of notice at Christmas time. Occasionally there may still be some products left in December (usually fresh pork) but we would love it if the orders were all completed by November 30th. Upon your first enquiry you will receive a document explaining the procedure for ordering. It outlines the products available, the dates of the Christmas farmers markets, prices and payment options. Please read this document thoroughly as, although I love to talk to my customers, this time of year is extremely busy for me and it is difficult to find the time especially if I am repeating the information I have already given. Each of my pigs vary in weight so I can only give you a rough idea of what size your chosen portion will be. This is more difficult with the larger cuts like whole legs and shoulders. Estimate 300gms per person and you will get an idea of how much you will need. Please give me more information than 'a small piece' as this is subjective. Note that I have limited stock to choose from and therefore you might end up with a slightly smaller or larger piece than you had anticipated. If you have a number of guests it is best to order a larger piece. 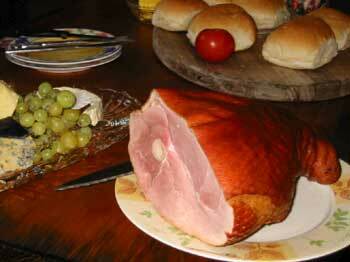 All products (including ham) freezes well so you will not have to worry about left overs. Don't forget to save the bones for soup. My regular customers know about the farmers markets I attend and, at those locations there are always special additional Christmas markets. Details of these can be found on the farmers market page of my website. These are where you can pick up your orders and at the same time you may also find other delicious products that you can purchase directly from a farmer. Christmas can be stressful for some people and I certainly find it so. The answer to most questions you are considering asking are usually found on my website and the Christmas order document so please read those first. After that I hope you do not have to ask questions such as 'are your pigs free-range? Customers who have been used to picking up their orders from the butcher in Camberwell are no longer able to do so as he has now closed. To sum up, I am a one woman band. I breed the pigs, I care for the pigs and I take the pigs on their final journey. My butcher takes over from there. We both hope you enjoy the fruits of our labours.